A special move (必殺技 or 必殺ワザ, Sure-Killing Art), also known as a special attack, is any move performed by pressing the special button, the B button by default. Like the name suggests, special moves are unique attacks that can have wildly different functions, unlike "normal" attacks (such as neutral attacks or tilt attacks) which often function as standard punches, kicks, and weapon swings. In many cases, special moves provide more tactical advantages compared to normal attacks and do more damage than smash attacks, although this differs between every special move. Special attacks are unique to a character's fighting style, and are almost always homages to abilities that the character can use in their home games; for example, Kirby can use his signature Inhale to copy abilities. Neutral specials are usually reserved for the fighter's only projectile (eg. Fireball), or a powerful attack with good KO power that can either be chargeable (Charge Shot) or have a long startup (Falcon Punch). Side specials tend to be attacks that give the fighter a momentum boost in a singular direction that is usually their only horizontal recovery option which may cause helplessness (Quick Draw). Some are projectiles that can be used for deterring approaches (Missile, PK Fire). Up specials are essentially a fighter's main recovery move (with the exception of Yoshi's Egg Throw and Jigglypuff's Sing) that give a fair amount of upward distance, and can either be damaging or non-damaging; almost all up specials cause helplessness. Down specials are often the most gimmicky of a fighter's special moves and the least straightforward, with most allowing the user to position themselves or their opponents (Dimensional Cape, F.L.U.D.D. ), generate items (Vegetable), counterattack and retaliate (Vision), or other forms of tactical advantages (Nosferatu). Usually, only special attacks can be projectiles (although some fighters gain projectiles in their normal moveset starting from Brawl, such as Snake's and Olimar's smash attacks, and Mega Man and Villager's aerial attacks), and some are able to render the user helpless if used in mid-air (usually those that function as mid-air jumps, like most up special moves). 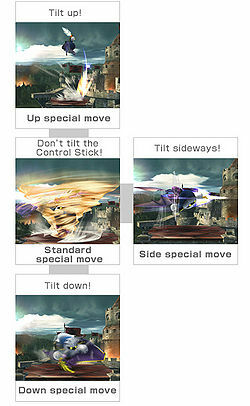 In Super Smash Bros., each character had three special moves: the neutral special, up special and down special. Super Smash Bros. Melee introduced one new special move for each character, the side special. Starting with Super Smash Bros Brawl, yet another special move was added, the Final Smash, which can be accessed when the Smash Ball is obtained. When obtained, the standard special move is then replaced with the Final Smash that usually does a very high damaging attack that can affect more than one person, but it can only be used once before obtaining another Smash Ball. With the character customization introduced in Super Smash Bros. 4, there are three options for each character's special moves (effectively meaning 12 move options per character). For example, Yoshi's neutral special, Egg Lay, can be replaced with either Lick or Egg Launch. DLC characters do not have custom special moves. In Super Smash Bros. Ultimate, character customization is limited to Mii Fighters, and so only they have access to custom specials. However, some characters have previous custom specials integrated into their default special moveset from the transition from Smash 4 to Ultimate. For example, Palutena’s side special is now Explosive Flame (replacing Reflect Barrier, which has merged with her down special), and her mobility has been significantly buffed to compensate for losing access to Lightweight. Meanwhile, Shulk had his Monado Arts changed to act much like his custom move Hyper Monado Arts, making them even stronger but at the cost of increased downsides, shorter durations, and lengthy recharge times. This page was last edited on April 18, 2019, at 15:05.